The following is an excerpt from the above book offered by the author as a blog for Global Vision Institute. It is taken from the chapter The Radical Systems and Cultural Transformer: Everyone’s Contribution. In today’s globalized world, people who care and have the courage to engage in tackling the major problems we face, such as climate change or dire poverty in a world of abundance, look for solutions that are equitable, enduring, and at scale. Radical transformers manifest the triple helix of our innate intertwined attributes – universal heart of compassion, equity impulse, discerning eye seeing patterns – in order to BE the contemporary pioneer, unifying architect, and mindful pro-activist simultaneously. They act at scale. When we touch the deeper side of ourselves, something opens up to the universe and we give unstintingly, accessing our compassion and our humanity. We hold self-awareness, our inner power, our courage and compassion, our spirituality as an essential foundation for a thriving humanity. We give of ourselves because we care and because we realize we are interconnected, part of a larger interdependent whole. Caring and willingness to give are essential, but they are not sufficient for shifting cultural norms and systems that lead to inequity and rectify the injustices of the world – we need to act. Radical transformers care deeply andsource universal values for action at scale in order to generate a paradigm shift. They address the three key issues underpinning many of the crises in the world today – inequity, exclusion based on our social and other identities, and the current economic and financial systems… . Scale requires us to design programs to transform these three underpinning factors with new policies, norms, systems, and structures and with policy-makers, businesses and communities. Our transformative personal practices and who we are BEING anchor societal and planetary transformation. And when we are committed to transforming inequitable, exploitative, and exclusionary systems and cultural norms that maintain the status quo, we should expect pushback. A few people with vested interests will resist change. Although most people want change, they are often very uncomfortable because they are not sure what will emerge and find it difficult to engage in the adventure of uncertainty. Uncertainty conjures up fears in our minds; we feel “out of control” because many of us have an assumption that we can control what happens to us and our children; in reality, we cannot control life’s events. Stakeholders and participants in learning-in-action programs consistently come up with an observation: people in their organizations or their partners do not understand nor appreciate the breakthroughs they generate. There are at least two aspects to this seeming indifference. First, our own vision limits what we can see. When human beings do not engage in their own unfolding based on their inner capacities and the universal values they stand for, they do not distinguish business as usual from transformative action – they do not have the lens to see, perceive, and appreciate the inclusiveness and depth of what is happening. Second, in our competitive world, we should not expect people to clap when we are successful. Joyfully celebrating another’s success requires a healthy sense of self, profound humility, and selfless generosity. We are the ones who gain most by our contribution, because we give the fullest expression to our whole selves and experience the joy of BEING in action with results. As long as we make incremental changes on the margin without rocking the boats heavy with vested interests and give as charity only (instead of giving as mutual empowerment), we are unlikely to face resistance. But the moment we stand in universal values such as dignity, compassion, and equity, and work with the inner capacities with everyone to create new patterns and new rules of the game, some people are threatened. Those who are threatened realize that when people engage from this powerful inner space of universal values, people will not allow themselves to be manipulated. Leaders in business, politics, media, academia, government and nongovernmental organizations know that the missing piece is the opportunity to source our inner capacities for strategic action and results. However, they generally do not invest in creating this opportunity, carrying on business as usual but expecting different results. People in leadership positions are often afraid they will lose control – this is also the case in families. We expect resistance – resistance is an indicator that we are pushing the envelope and rattling the status quo. New ideas and approaches take time to seed – but that is no reason for anyone to give up. And it is vital to establish strategies to openly support principled risk-takers… . …Burnout is the frustration of having to face resistance. When we commit and act to generate equitable and sustainable results and face constant pushback and resistance, it may be hard to keep going. Active burnout shows up as frustration and anger. Passive burnout shows up as withdrawal and resignation. How can we prevent burnout? When we constantly source our stand and inner capacities for action, we are able to transcend our reactivity and frustration. We relate to resistance not as something wrong or bad but as an inevitable part of change. Generating and sustaining community engagement in the face of resistance is vital. We work with partners in a way that they are able to initiate and sustain action, transcend positional differences, and recommit to their stand and inner capacity as the source of strategic action. BEING courageous in spite of fears and knowing that we are bigger than any fear keeps us engaged. …We spent time “rebooting” ourselves. Change agents inevitably face set-backs in their work on social justice and human rights. In order to go beyond their frustration, it is essential to reconnect to our larger purpose and notice changes that we have made even when it seems hopeless and we think we failed! We reconnected with what we stood for – the universal valuesthat guided our actions. Monica Sharma, trained as a physician and epidemiologist, worked for the United Nations for more than 20 years. Currently, she engages worldwide as an international expert and practitioner on leadership development for sustainable and equitable change. She works with the United Nations, universities, for example the University of Virginia and Johns Hopkins, management institutions, governments, businesses, media, and civil society organizations. 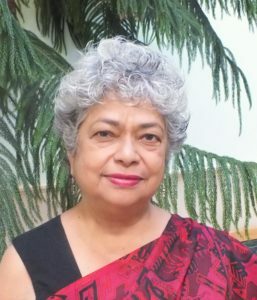 She is the Tata Chair Professor at the Tata Institute of Social Sciences in Mumbai. She has published and presented over 250 articles in journals and international forums.